Hey guys, are the kick panels for the plyms supposed to be symmetrical or are they different left to right? I've seen a couple sets on ebay, one set was the same but the other was different so I'm not sure which route to take. Hi Chris. Have you tried SMS auto fabrics? Pretty sure they sell them. I haven't actually, I will probably be ordering my door panels from them at some point but I've heard I can expect a long wait. I should send them an inquiry. Thanks. Your welcome Chris. Just be sure and take the time to get samples to match your interior. A bit more time consuming but worth it! Do yourself a favor and don´t order anything "ready to install" from SMS. My doorpanels took 18 months. Also there is no need to order kickpanels as they can easily be scratch build. It´s just cutted cardboard, nothing more. I wrapped it with the same vinyl I used for the seat covers and edged the front end with seat welt. Those do look nice! 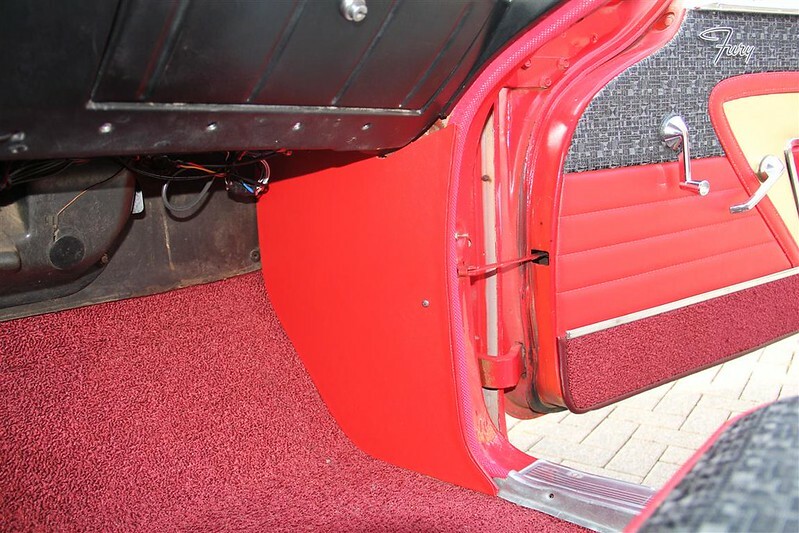 Were you happy with the quality of the door panels? I know it can take a long time to get them but I like that SMS will make the panels without my having to send them my old ones. I ordered finished door panels and material for the seat covers February 2011 and had to wait 20 months. Not caused by the vinyl and cloth material but the door panels. Although they came out very nice I cannot understand that there are still people around who order them, knowing that they have to wait extremely long. My advice is: Order vinyl, cloth, seat welt and windlace from them as loose material. Save your old interior and let the panels be made by a good upholsterer. They can do it! What SMS does is not unique art! I saved all the pieces of my old, worn out and damaged original Fury interior and gave it to a friend doing a 58 Plymouth restoration. His upholsterer used it for pattern. They came out as well as mine!